You’ll spend most of your life in a small cubicle grinding away long hours to impress your boss, slowly climbing the corporate ladder, with far off dreams of retiring. You’re probably wondering do lifestyle and financial freedom only start after retiring at 65? What if we told you it doesn’t have to be that way? Download the Untemplater Manifesto and read inspirational stories of people just like you who embraced an untemplated lifestyle in their 20s and 30s. You don’t have to be old and gray to be able enjoy life’s riches: time with family, travel, and the opportunity to pursue your true interests as a full time gig. Best of all The Untemplater Manifesto is free! So download a copy today and get inspired to start on your own untemplate journey today. Don’t wait for anyone to give you permission to live the life you want. 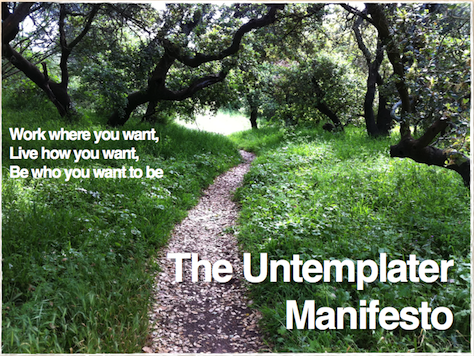 Download the Untemplater Manifesto today and learn how to take back control!